Fits door stiles as narrow 4-3/4"
Includes Strike - 299 – Dull Black. 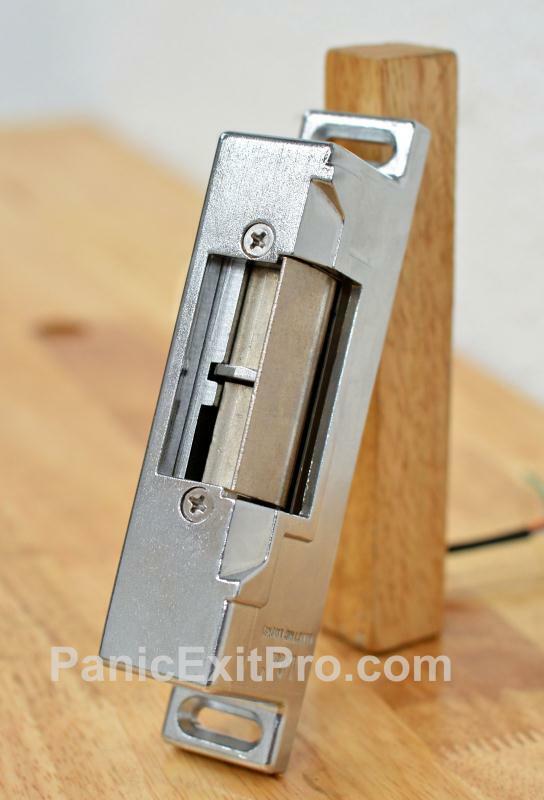 Panicexitpro.com offers a comprehensive product range to control the movement of entry/exit point doors. It is essential for building owners to be able to strike a balance between opening security, safety and durability at a cost that meets business objectives. Panicexitpro.com products are designed to meet the most common installation and application requirements in the commercial marketplace so that these products exceed the needs of customers who value reliable door control products, excellent service, and prompt delivery. To this end, all panicexitpro.com emergency push bars are designed of the highest quality materials. 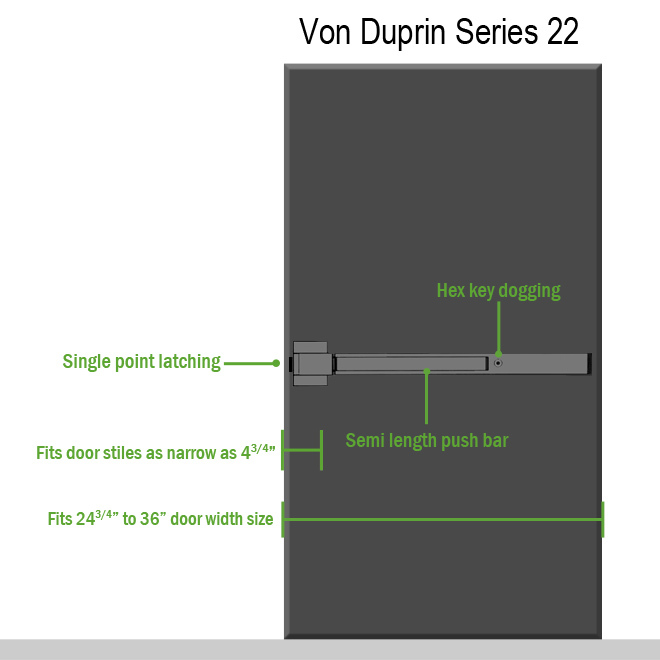 The working internal mechanisms contain no plastic components, while the cover and chassis are made of stainless steel.Von Duprin 22EO, exit only rim exit device. The 22 series exit devices are an economical alternative incorporating a modern touch bar styling for all types of doors. Exit only, no outside operation. Trim sold separately. Covers stock hollow metal doors with 161 cutouts. Fits door stiles as narrow 4-3/4" with #299 strike . Non-Handed (works on left and right handed doors). Device is 3' length and fits doors 24-3/4” to 36”. Latch Bolt- Deadlocking, 3/4" throw. Finish is sprayed aluminum (SP28). Von Duprin created the first panic exit bar in response to the Iriqouis Theatre Fire of 1903 in Chicago. The fire caused the highest loss of life in history for a single building fire, taking a total of 602 lives in 20 minutes.